A Candida saliva test is the easiest way to see if you have an overgrowth in your digestive tract of the Candida Albicans yeast. The only time you should perform the Candida saliva test is first thing in the morning. This is before you put anything in your mouth, so it’s a good idea to leave a reminder for when you wake up. Although it’s only 24 hours till the next opportunity it’s still slightly annoying when you wake up, eat or drink something and then remember you wanted to do your saliva test. When you wake up fill a glass with water then you just spit into the water. Afterwards just leave it standing for about 30 to 45 minutes then have a look at it. 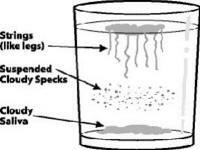 If you have stringy bits hanging from the saliva, and cloudy specs that sink to the bottom of the glass ( like the daigram above ) then you probably have a Candida yeast overgrowth problem. IF you are suffering from the Symptoms of yeast a infection then it’s a very high chance you are suffering from candidiasis. Once you have established you are suffering from candidiasis you need to start an anti Candida diet that will starve the Candida. Then you need to kill the Candida, and repopulate your digestive tract with a good quality probiotic. You can learn more about that here. Leaving candidiasis in the hope it will cure itself will only let it grow further out of control in your digestive tract. Many women worldwide suffer for months before they associate their symptoms with a yeast infection. And the longer it’s left, the longer it takes to get back under control. Please don’t be one of those women.